News: This PhD Thesis was awarded with an ETH Medal. As the eternal second (although my thesis was finished first ;-P), I’m following Vlad’s great idea to make the final version of my thesis available to you, WoTters! 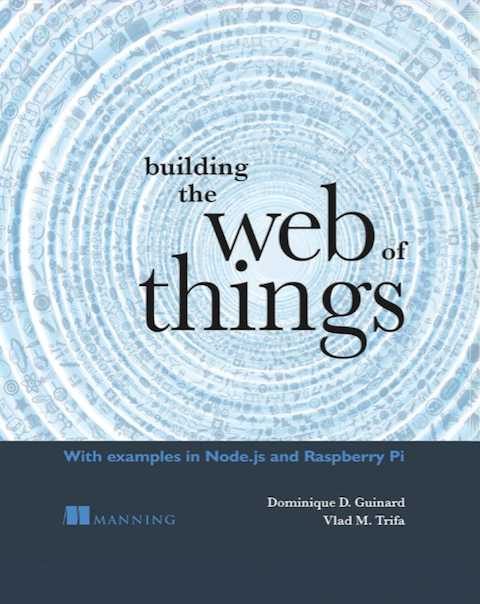 Vlad and I were always pretty complementary in building our shared vision of the Web of Things. As such, my thesis is focusing more on the “software engineering” aspects of the Web of Things. I’d like to see it as a cookbook for implementing the Web of Things in such a way that for every cross-cutting concern, there is a Web recipe! The architecture (see figure below) proposes Web solutions to 4 of these concerns: accessibility, findability, sharing and composition. It also introduces the Social Web of Things (where things use social networks) and the notion of Physical Mashups (where things can be used easily in 2.0 Web mashups). […] The Internet is a compelling example of a scalable global network of computers that interoperate across heterogeneous hardware and software platforms. On top of the Internet, the Web illustrates well how a set of relatively simple and open standards can be used to build very flexible systems while preserving efficiency and scalability. The cross-integration and developments of composite applications on the Web, alongside with its ubiquitous availability across a broad range of devices (e.g., desktops, laptops, mobile phones, set-top boxes, gaming devices, etc. ), make the Web an outstanding candidate for a universal integration platform. Web sites do not offer only pages anymore, but Application Programming Interfaces that can be used by other Web resources to create new, ad-hoc and composite applications running in the computing cloud and being accessed by desktops or mobile computers. In this thesis we use the Web and its emerging technologies as the basis of a smart things application integration platform. 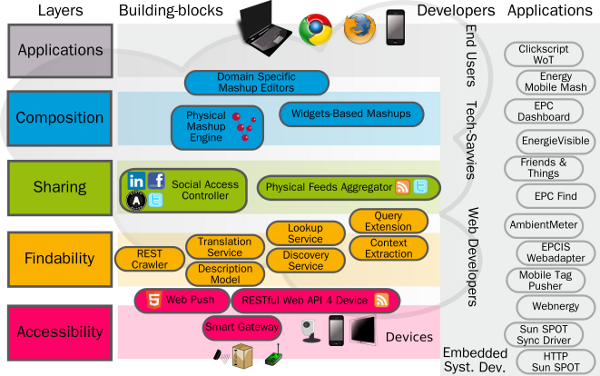 In particular, we propose a Web of Things application architecture offering four layers that simplify the development of applications involving smart things. First, we address device accessibility and propose implementing, on smart things, the architectural principles that are at the heart of the Web such the Representational State Transfer (REST). We extend the REST architecture by proposing and implementing a number of improvements to fit the special requirements of the physical world such as the need for domain-specific proxies or real-time communication. Our primary goal in bringing smart things to the Web is to facilitate their integration into composite applications. Just as Web developers and tech-savvies create Web 2.0 mashups (i.e., lightweight, ad-hoc compositions of several services on the Web), they should be able to create applications involving smart things with similar ease. Thus, in the composition layer we introduce the physical mashups and propose a software platform, built as an extension of an open-source workflow engine, that offers basic constructs which can be used to build mashup editors for the Web of Things. Thanks a lot Azu, hope you where happy to find some of the stuff we worked on together there 🙂 Hope you’re all well, push me some news if you have time one of these days! Hope that will help you Armin, good luck with your thesis! Do you have the latex template that you used for your thesis? It would be nice if you can share. Hi, do you have any idea about case study for your WoT architecture? that have simple develope.